Frank Perie was born on 20 July 1889 in Sierra Leone, West Africa. In the late eighteenth or early nineteenth century, Perie made the voyage to Britain where he was most likely employed in the maritime sphere. At the age of 22, he had saved enough money to board the Alan Line Steamship, Lake Earie as a steerage passenger. The vessel departed from Clyde, Scotland and arrived in Boston, Massachusetts on 5 March 1911. The reason for Perie’s venture across the Atlantic remains unknown. However, it is possible that the uncertain social and economic climate for Black seaman in Britain contributed to his decision to leave the country. During the First World War, Perie returned to Britain and served in the Merchant Marine. Once the global conflict was over, he had settled in Hull where he continued in his profession as a fireman on board steamships. In early January 1919, he took employment on board the Ellerman’s and Smith Line vessel, the Oristano. Shortly, after his return, Perie joined the Lord Ormonde which travelled across the Atlantic from Hull to New York. He was described as 5 feet and 8 inches tall weighing 150 pounds and had a heart tattoo on his left arm. He arrived safely in New York in December 1919 and journeyed back to Hull shortly after. In 1920 Perie was employed on board the Cleopatra III which embarked for London from Victoria Dock, Hull on 28 April. 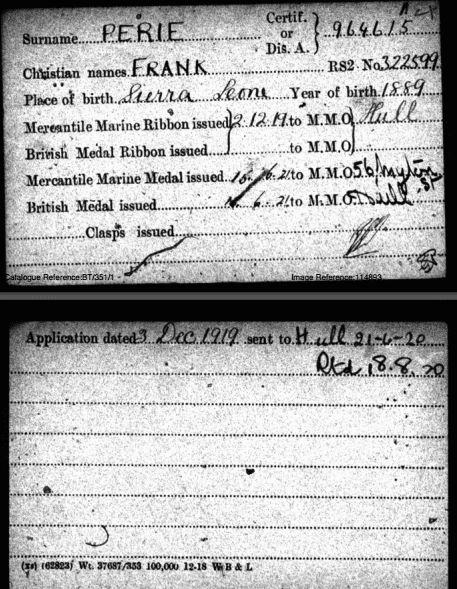 While Perie was on board this vessel, his First World War medals were sent to his home address, 56 Myton Street, Dickson Place, Hull. However, sadly they were returned on 18 August 1920 as he was not there to collect them. Between 1920 and 1929, Perie was employed on board vessels that sailed to central America, the Caribbean and to various other destinations in Europe. Thus, while he resided in Hull and no doubt felt a degree of nostalgia for the port while on his travels, Perie’s time in the city was limited due to the nature of his job. 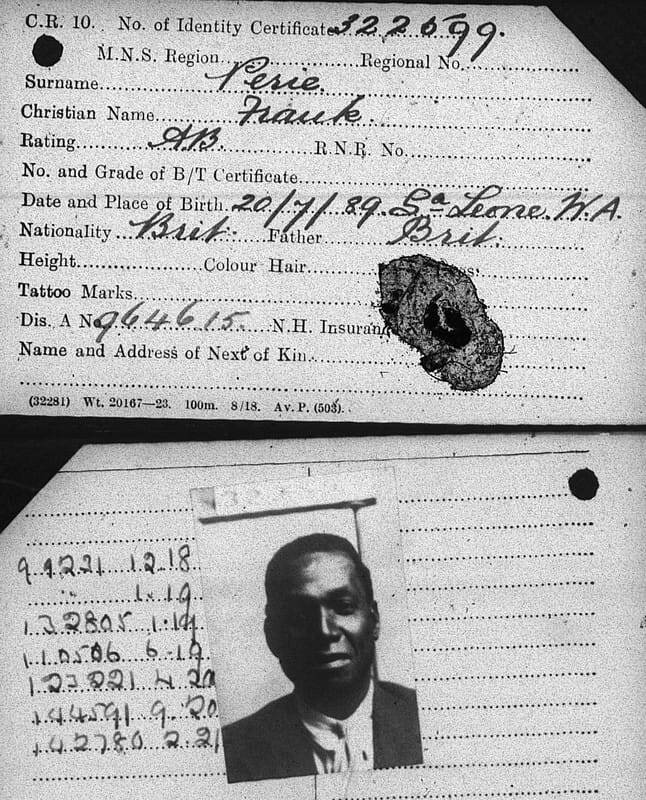 Information about Perie and his whereabouts between 1929 and 1939 are sparse. However, during this decade he changed his career and moved to London. In 1939, at the age of 50 Perie was listed as an African showman living at 38 Stanhope Street, St Pancras. The census demonstrates that he was married but there is no evidence to suggest he was living with his wife. Unfortunately, it has not yet been determined who she was or if she remained in Hull. National Archives and Records Administration, Washington, D.C; Book Indexes to Boston Passenger Lists, 1899-1940; T790:41 and Nottingham Evening Post, 6 March 1911, p. 6. Ancestry.com, New York, Passenger Lists, 1820-1957 [database on-line]. Provo, UT, USA: Ancestry.com Operations, Inc., 2010. Hull Daily Mail, 29 April 1920, p. 6.